Industrial dryers are for drying air very quickly. These are different types of drying equipment based on the application. An industrial dryer can quickly dry the moisture in the air. We supply numerous types of dryers in all Middle East and African countries. As the process is drying of air, these are also known as air dryers. Drying process involves evaporation and hence these are also known as evaporation dryers. Air dryers make the evaporation process faster. Drying of briquettes during manufacture. While briquettes are heated, moisture spreads into air. It is essential to remove this moist air quickly so that the briquettes are of high quality. Air dryers are useful for such applications. Drying during pharmaceutical manufacturing. During process and packaging of pharmaceuticals, the air has to be absolutely dry. Dryer for clean room to remove moisture and to keep low humidity levels. Electronic manufacturing areas require absolutely dry atmospheric condition. Removal of moisture using industrial dryers during food processing and packaging industry. We can use these as carpet dryers. Wet carpets cannot be dried efficiently without use of air dryers. Drying of wet floors and wooden floors can be done efficiently using industrial dryers. Dried fruit processing and packaging requires moistureless environment. Metal fabrication and welding industry needs a dry atmosphere. This is essential to maintain high quality metal joints. It can reduce unpleasant smell caused due to moist air. 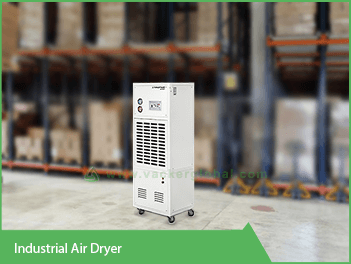 This is a condensation type air dryer suitable for small and medium type applications. This does not need any detailed installation process. The user can simply plugin the device and it starts working. The condensed water has to be drained out by connecting a pipe to the dryer. It has a drying capacity of 30 liter per day at an ambient temperature of 20 °C and Relative humidity of 60% RH. 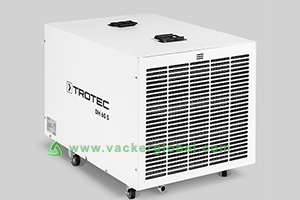 It has an air processing capacity of 1100 m³/h. It can operate within a temperature range from 1°C to 40°C. It can operate within a humidity range of 30%RH to 100%RH. The operation voltage is 230Volt, 50 Hz. The type of cooling agent is R-410a. It has an internal hygrostat to adjust and control the required humidity. It has an integrated water pump to pump the condensed water. It comes with an automatic defrost system so that frosting does not happen. Pressure gauges are available to indicate the pressure of the refrigerant. It has a maximum drying capacity of 175 liter per day at ambient temperature of 30°C and 80 % RH. It has an air processing capacity of 2000 m³/h. It can operate within a temperature range from 5°C to 32°C. The operation voltage is 3Phase, 400 Volt, 50 Hz. The type of cooling agent is R-407C. It is relatively silent producing only 70 decibel at a distance of 1 meter. An industrial is also known as an Industrial fan. This is used to circulate the air faster than the usual rate. This will help the drying process. These may not be suitable for a residential environment. You can use our heavy duty fan model 1500 for such air circulation needs.